Raise the curtains and put on a show with the HABA Prince Glove Puppet! 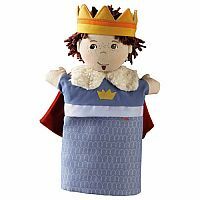 This friendly face is regal and ready for any theatrical production your little one puts on. Lovable, plush character is sure to steal the show. Perfect for ages 18 months and up. Use with other HABA hand puppets and the Puppet Theater, sold separately. Measures approximately: 10.00 x 7.00 x 3.25 inches..